I believe that I read Cooper was given 4 parachutes with the money, and one of them was actually a dummy chute. 2 were latest technology and 2 were extremely old parachutes. The fact that the suspect took the two older ones and one of them was a dummy says a couple of things. Most probably he thought that taking two would give the indication that two people were involved, and that they were old may indicate his age. If you haven't parachuted in say 20 years, the newer ones may have been confusing or intimidating while the older ones were familiar and chosen. To say that he took the dummy parachute is almost to say he didn't ever really look at it. Besides, the individuals who gave it to him didn't catch it either, obviously. But, what makes me go hmmmm, is that after the fact the parachute is gone, how was it recognized that a dummy chute had been given if it never appeared??? Who would have thought after the fact, "oh shoot, I gave him a dummy chute." I am not sure how they discovered that fact unless it was given to the suspect on purpose. Maybe, the suspect took it to say that he was smarter than they gave him credit for, or that this would instill that he chose the wrong chute and fell to his death to never be found??? Nanette, I don't follow what you mean on this document? Aren't the three a's a reprint on that letter. In the Cooper caper, they said he bailed out of the plane wearing loafers and that the shoes probably blew off of his feet. One pilot said he thought Cooper ended up in Lake Merwin. The bills found were near Vancouver in the Columbia River, many tributaries east of the Columbia feed into it. I read that the dummy chute was well marked as a dummy and hard for Cooper to have missed. Cooper was seen tying the money bag to his chest with several lengths of cord. The military chutes were rejected by Cooper because they were self deploying vs the older ones that had rip cords. The FBI points out the bills found reinforce the notion the Cooper died in the jump because they doubt that he would have left any of the hard won loot behind. There are conflicting reports as to how fast the plane was traveling. It was raining hard and there was a strong southern wind at the time. Some report the planes altitude was around 5000 ft not 10,000 ft, were it's much colder. The plane was said to have been on a specific airway track used by cargo planes. Given all of the specific technical planning Cooper did, there is a good chance he had an accomplice. According to one source, he may have had an expensive walkie-talkie with him? He'd have been facing an awfully long hike out of that area without the aid a vehicle. Especially risky too given the fact that the next day the area would have swarming with people looking for him. So.....he could have pulled it off and survived but didn't dare spend the money, or the money blew off of him? Maybe the $5800 was planted? Who knows? I don't know if the Federal Reserve actually kept track of the bills during that era?Or how they did it? The bills were non-sequential and were L prefix bills, most of them were printed in 1969. I would assume that they kept track of all of the bills that come back into the Federal Reserve banks? Except for that funny letter, I've had enough of the Cooper caper. I don't understand you now. What do you mean "re-print"? The a's are handwritten, but are not part of the type-written script as if to say that the suspect wrote what was typed, and the "a's" we requested verbally by the detective to be written by the suspect. Which means they were looking for this letter pretty specifically, and if you asked me, I would say that the bell top "a" is one of the most significant letters in Jack's arsenal. So very unique and individualistic. 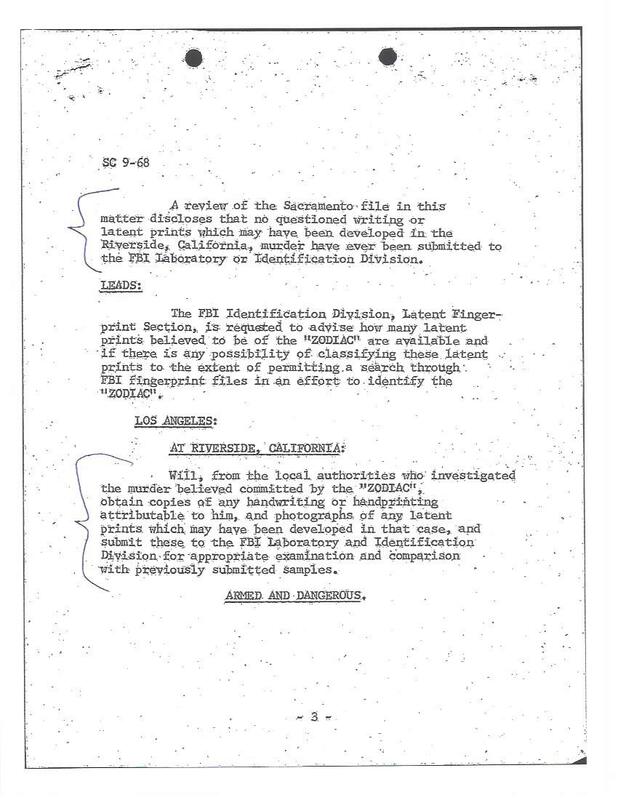 If the notion was that they were looking for it, then it should have come to no surprise that I declared the existence of this particular letter "a" was erased from the public eye through alteration of this letter in the only communications that he accidentally used it in. I have said that from the beginning in 1945 that Jack was disguising this letter in most of his communications due to the odd and unnatural versions he showed to use. Interestingly, Daniel Cooper was the name used, and it was obviously fake or they would have found a Daniel Cooper. The only male Cooper found at that time was questioned, and his name was DB Cooper. The heist was then named DB Cooper by slip of the media... So, if we know that a fake name and alias was used, why would we even consider anyone named Cooper? That's silly in itself. And, if someone was using a partial fake name, they certainly wouldn't be giving any portion that was correct so it could be tied back to them. I don't know, I guess that it seems like that message was taken out of context, like it's only part of a communication? It just doesn't seem to make sense with the way it's written. It seems that I've read it somewhere else and it's part of a longer letter? I can't remember. Otherwise, I don't get why he'd have the three letters 'a' in a row? And I don't get the shaking hands thing? Yeah, it would be kinda goofy for him to use his own name. Of course it's kinda goofy to bale out of a jet with the sudden impact of air pressure at 120-200 MPH. You'd want goggles, a nut cup of some sort, a helmet, hiking boots,dry warm clothes. Then, when you're within the last few feet from the ground you'd wanna pull down on the chute rings or you'd really hit the ground hard. You could get caught in a tree, impaled. Or hit the water and if you didn't drowned, you'd risk dying of exposure. On one hand Cooper seemed to have his ducks in a row but on the other....no way, especially at night. The more I think about this crime, the more I'm convinced he'd have to have had an accomplice. The crime shows cunning and stupidity all rolled up in one. Maybe he had a vehicle stashed near the drop zone. But what if he'd broken a leg? It's crazy stuff, that's for sure. It makes me wonder if there was a cubby hole in the plane that he could have hid in? I'd have baled out near Reno, where it's flatter and drier. I get your point about the bell-top a's. Sorry, I was up too late last night. In other words, you suspect that the bell-top a's were being suppressed, right? It also dawned on me that in the Cooper caper, that a southern wind might have been more of a south-western wind. That could account for the bills being found where were, which was approx. 5 miles northwest of Vancouver in the Columbia river. Cooper might not have even got a chance to pull the rip chord? It's a weird crime, because parts of it required technical information to achieve, but for him to actually bale out of that jet at the speeds reported and in the rainy dark of night....wow. He demanded 15 degree's of flaps, which will slow the plane down and give it more lift, which requires more power. Some reports claim that the airspeed could have been as low as 80 knots, which works out to about 90 MPH. For all of his planning, Cooper had to have some plan as to when to bale out. So far, I haven't seen an explanation of this aspect of the caper. "How did Cooper know when to bale out?" An accomplice with a light? A radio station network of towers with red lights on them? He needed a landmark in the dark, that's for sure. It's no longer a suspicion when all traces of the bell top "a" has been removed from the letters in the viewable public eye. Starting with Robert Gray Smith's first book in 1986 where they can be seen in print, what I would say was a bell top "a". By Robert Gray Smith's second Zodiac book in 1996(not sure of actual date) this bell top "a" is no longer there. Then you have all media sources from SF Examiner and Chronicle, and Tom Voigt portraying this very same version. FBI stop their report on the Zodiac by 1991, and that certainly doesn't make sense. Obviously this killer is crossing jurisdictions with his crimes, children are involved, and he's a SERIAL killer. Why would the file with the very people meant to track these kinds of things/people, stop investigating any leads??? I spent a lot of time working on the "a" alteration factor, and now I find out that it is exactly what law enforcement was looking for from interviewed suspects... I'd say yes, that the bell top "a" has been suppressed, and that really pisses me off. I have been slammed for years because of Jack's "a" not showing up in the communications even though I believed that the highback "a" that I refer to on the handwriting slide of the Zodiac's writing was an awful attempt and inability to completely stop doing something that was very much a habit. It's the will fighting the unconscious brain in the respect of auto pilot because truly you can be on auto pilot and write. This is how one can read, remember, and write all at one time. To change these natural habits you have to concentrate on the act of writing which is something most of us are not use to. This is taxing and in my mind, impossible. This is why I knew there would be this "a" somewhere. Not only because everything else in Jack's handwriting was too much of an identical match, but because he left behind the signs of something different, something reminiscent of a bell top "a". Plus the bell top "a" in RGS's book. Just look at the handwriting I have put up on the slides. It doesn't get any better than that... First and foremost, I have several different kinds of handwriting from both authors (different type circumstances and instances), and different types of script within their arsenal. It doesn't get any better than that for a document examiner. Where I lack in quality, I certainly have quantity to determine the accuracy of the letters. So far my point is that for every style or type of letter script the Zodiac uses, so does Jack, and if Jack was not the Zodiac Killer, his handwriting should be different somewhere, somehow, someway. If you agree that the money could no have resided on that shore for the amount of time it should have and be in the pristine condition it was in, then you can't surmise that the wind had anything to do with the placement. Think about it, it's found in a location that points to the very place the suspect went right after the heist - Canada. At least it seems to me that it was planted years after the fact. I would have to check the dates to see if they play in anyway to the anniversary theme we see in many of these crimes. The Canadian connection that I claim occurs between Tim Miller's letter and the return sender of the 4th grader in the Anthrax attacks. Jack was in the Air Force = correct me if I'm wrong, but he would have jumped out of an air plane, right? Jack is an avid orienteer who could call out lakes flying over a state at 35,000 feet = the suspect in the Cooper caper was said to have called out Lake Tacoma at 22,000 and stated that it was miles from an Air Force Base. Jack/Zodiac = is just crazy enough to have been able to do this...Funny, Jack claimed a back injury in 1972 at Tahoe Linen Company??? Jack was familiar with air flight maps - knowing of the area and able to determine an approximate location for a drop based on a predetermined time, speed and other factors. This could allow him to choose a proper drop zone where yes someone would be waiting to extract him. I actually would like to map out the area and see how it fits in to where Jack was living in South Lake Tahoe mountain area. The Zodiac's/Jack's big ploy was based on Time, Location via longitude and latitude/radian theory, and an innate ability to know areas that law enforcement believed to be rather secluded and out of the way places to the average public. We have Jack's equations and mathematic ability which would play right into figuring all the necessaries for pulling of a safe landing. Even in the rain and thunder. 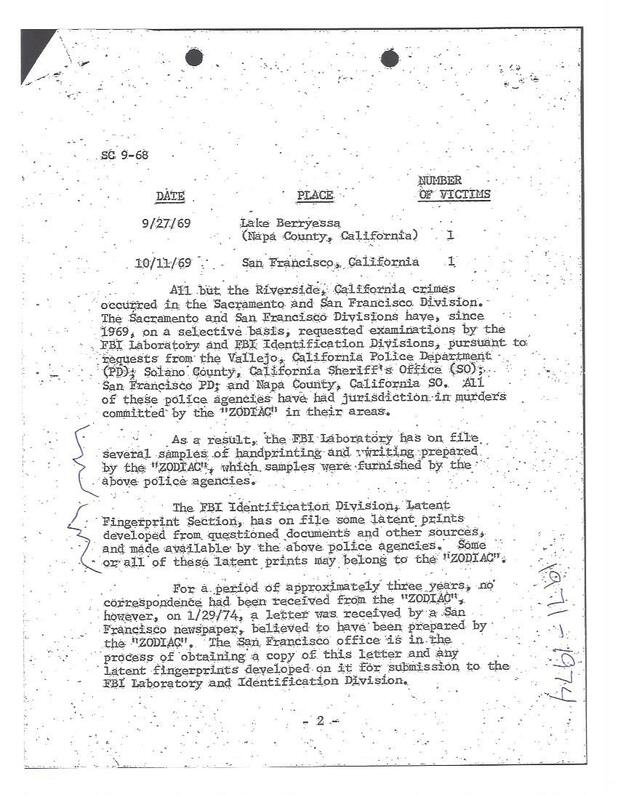 Here is another communication from San Francisco Police Department to the Director of the FBI dated 2-6-1974 claiming that the Cheri Jo Bates and Riverside activity is one and the same Zodiac Killer. Why are they trying to tell us now that they are not connected??? 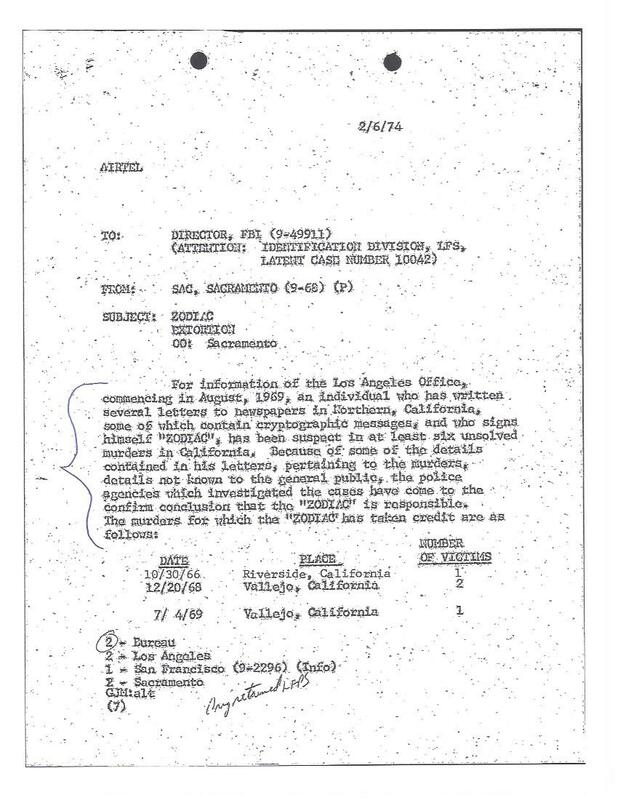 This cable states that there is information in the Zodiac Killer letters that was not known by the public from the crimes in the Riverside and Sacramento areas. Jack lived in Riverside, CA 1951 and 1952 with Letha, so he has proximity and knowledge of this area. I go along with this having Jack involved but not the description of Jack matching Cooper, whomever Cooper actually was? Do you agree? I've seen pictures of actual people that closely resembled the Cooper composite. Can Jack be made up to look like Cooper? Otherwise, I follow what you're saying and you make a good and strong argument, the crime looks and sounds kinda militaristic, to me,too. The money does seem planted. If the area is swept with cadaver dogs, they'd have found Coopers remains, with all the efforts that have been made, the remains would have turned up by now. So yeah, money planted highly possible but where is the rest of it? Jammed in 12 feet of mud? Even so, it would release corpse gases to the surface, if it's Cooper. I'm sticking with a precise parachute drop, probably triggered by some lights. Otherwise, I agree Nanette. The Cut Out message, 100% Genuine Zodiac JAcK baby! You Rock! You Rock on the bell-top a's too! BTW, Happy New Year to you! So we have the facts that say Cooper really did his research and that he had a lot of specific technical knowledge to be able to pull of the caper, except for a few odd things. First he demanded the plane be flown slow at about 80-100 knots with 15 degrees of flaps, the landing gear down for more drag to insure that the pilots couldn't fly the jet too fast. That way he could bale out at as low of an airspeed as possible. He knew that the rear door and stairs could be opened in flight, the same of which shows esoteric knowledge of the plane. He picked a flight path that also showed technical knowledge, a path which allowed for a rather low altitude of 5000 feet, meaning a controllable and fairy accurate drop. He demanded non-sequential bills. He knew the size and weight of the loot, the same of which was a reasonable load for him to carry. He recognized Tacoma from the air and knew where the local Air Force base was located. He knew about refueling the plane. He shut the cabin lights off so a sniper couldn't get him. He had the jet parked in a well lite area. He showed great control of himself and the situation he was in. He picked parachutes that had manual ripe cords which are more useful and safer for a low level drop. Now for the odd things: He didn't ask for helmet,goggles and boots (as far as the public knows). He wore a long rain coat and loafers (as far as the public knows). He opened the rear stairs at 8:13pm and baled out at about 8:20pm (as far as the public knows). He would have needed a specific point of reference visible at night in the rain (radio tower lights, an accomplice working lights on the ground?) He'd of had to wait a few, maybe up to 10-20 seconds to pull the ripcord. He was not seen exiting in the dark by the two jets following behind the jet he was in. No trace of him or the money was found the next day, despite a thorough search of the area from the ground and from above. No trace of his corpse has ever been found, only a rear stair instruction card and $5800 in tattered bills were ever found to this day. The government claims that none of the bills ever showed up. You'd think that if his corpse was out there, the dogs would have picked up the scent eventually. Many people have gleaned that entire area, they found other remains but not Coopers. So, other than the tattered bills found several years later, no other trace of him has been found. Given that fact, coupled with all of the esoteric technical information Cooper had, I'd say he survived the drop. The odd pack of $5800 in tattered bills says he lost control of the situation, or does it? Very odd indeed. I did a little more research and I'd guess that the best spot for Cooper to bale out would have been right over the Battlefield WA VOR (VHF omnidirectional radio tower, for aircraft navigation). This would have given him a large flat target area with no trees to land in. He had to have planned for a safe area to land himself. The black briefcase could have contained a small VOR locator radio to track the flight path, technically an easy thing to do. The VOR station was remote enough but had several roads outward. There may have been a better jump spot south of that VOR but I didn't see one. Things have changed since 1971, so more research would be needed. The area I just noted has been pondered by others too. The case seems to have had a number of contradictions regarding the flight path, drop area, etc. Again, he would have needed a jump site trigger and target and a large open area to land in. Now, if the pilot switched to the next southern VOR early, that could have messed Cooper up but I'd guess that Cooper figured that into his planning, usually they wait till the VOR reverses to do the course correction. Nanette, the whole business of the Cooper caper reminds me of the rivalry between J Edgar Hoover's FBI and the CIA that was ongoing at the time of this crime. Hoover died in the spring of 1972. I just finished reading the book: 'J Edgar Hoover, The Man and the Secrets', written by Curt Gentry. Hoover was bad news for this country, he had files on everyone that were filled with illegally obtained information, leaving any possible rival open to blackmail. The files that turned up after he died support this statement, so do the statements of many of people from that time. The Cooper caper left the FBI looking a little inept. Again: I think the key points to be made about the Cooper caper was that it was a 'high tech' crime, and Cooper would have needed a safe and clear area to parachute to. That part of the world is filled with obstacles, so there's no way that Cooper would have left something like that to chance. The CIA was using that same model of jet to drop operatives in North Vietnam, that information was also esoteric. OK Nanette, your post numbers #97 and #98 are extremely important points in this whole matter. I realize that I've been running long on the Cooper caper. Yes.....why is the FBI now claiming 'no connection' in the Bate's murder etc, when they clearly wrote otherwise during that era? These recent developments bring things 'full circle'.IMHO. You rock Nanette, you really rock! Nanette, the a's on the Ramsey ransom note were definitely a bone of contention in that case. Perhaps the suppression of the bell-top a's was because of that case or maybe a similar case, since the heaviest suppression appears to have begun around 1994? I think we're seeing a 'full circle of evidence' that involves one or more persons in a controlling position within the Federal government being behind the suppression. This fits in with many suspicions we've both had for quite some time now. Do you remember that I've stated the opinion that Jack was 'turning' on his handlers, or maybe it would be more accurate to say that he was keeping his handlers at bay with the way he structured his documents? Well...I still stand by that statement. I've also stated that the Ramsey case in particular had "military" overtones. Not only in the technology applied to the dossier on the Ramsey's but also the lock-step way 'all of the Kings men' conspired to lay the crime on the parents, over and over. I'd say the Cooper caper also has military overtones when you consider the esoteric information about that particular type of passenger jet being used for secret low altitude CIA drops in the Vietnam war. Now...here's a hypothesis based on the 'rhyming names' factors that we've been noting in these most definitely linked murders. And you and I both know that these rhyming factors are something that is gonna make us look downright crazy for pointing out. Nevertheless, they are exactly what former FBI profiler John Douglas wrote about with regards to 'order out of chaos', which is the killers way of coping with the chaotic act of murder, he does something to the scene to restore order to that scene, because deep down he knows he's done something very wrong. Without naming all of the other rhyming names involved, and there are several, how about victim Chris Busch equals a point to the Bush family? Who else do we know that has had a long career in a key position in the CIA, then the executive branch twice? Are they puppets, or puppeteers? Edited to add: Could the Ramsey murder plans have started as early as 1994? I'd say that there's a good chance of that when you factor in the products that Access Graphics were said to be selling. John Ramsey was in a prime position to climb the big corporate ladder, right thru Lockheed-Martin and on up. Also noted: Daxis was (maybe still is) a Pentagon project too. Sherwood Morrill questioned-documents expert for the State Bureau of Criminal Investigation and Identification spent four days comparing enlargements of lettering from the Riverside case with that in notes sent to The San Francisco Chronicle by Zodiac. 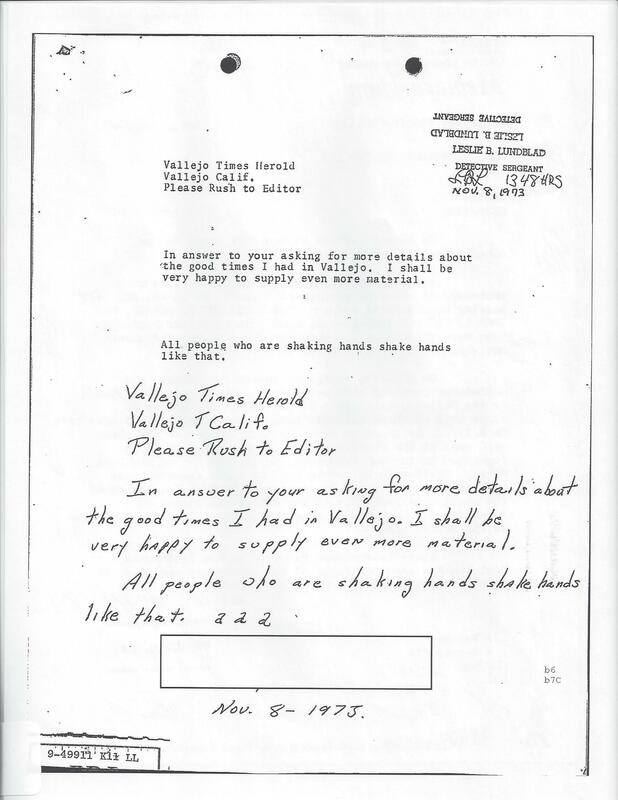 "The handprinting scratched on the desk is the same as n the three letters, particularly like that on the envelopes and this handprinting is by the same person who has been preparing the Zodiac letters received by the Chronicle" Morrill said.